Time or money? And my new mittens. 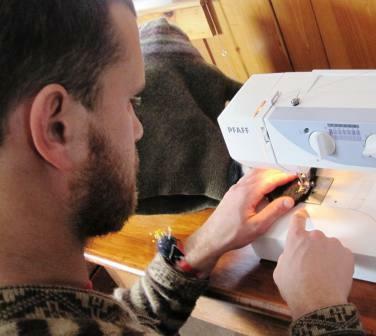 Ian is sewing some of the shrunken wool. At left is the sweater I used for my mittens, before cutting. One of my clients just decided to give up her paid job and focus on taking care of her children. It’s an investment in the future and the present. By reducing the stress, she can take better care of herself and her marriage, then take better care of the children. With less money and more time. Time is love. Good parenting is all about time. Love is spelled T-I-M-E.
My finished mittens lined with fleece with a shrunken sweater shell. I used fancy yarn from the yoke, and a darker sweater for the left mitten because after I took them apart AGAIN, I needed more material. Because they're original, they will not get stolen at a ski area. 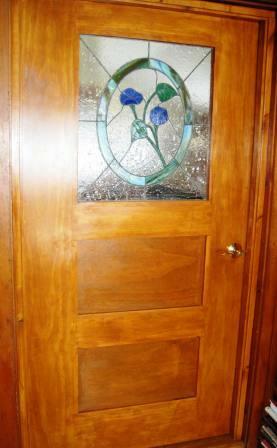 Ian custom-built this pine door around the stained glass window. The more money you have, the more you spend. The less money you have, the more carefully you spend it and the more you learn to do yourself. The most important things in life are not things. 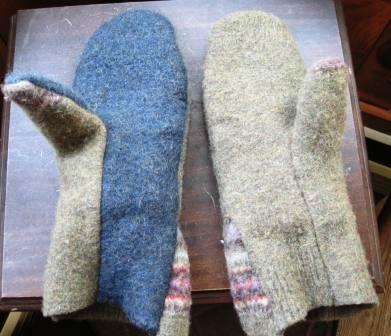 Ian and I spent an afternoon together designing and redesigning the mittens, then fitting them and re-designing them. It would have been easier to download a mitten pattern or buy one for a few bucks! Ian is just as comfortable sewing mittens as he is building a door and installing it. They are SO WARM! I’ve had two pair of expensive mittens stolen from ski areas. These are steal-proof. 1. Get from your closet or a thrift shop a few 100% wool sweaters with some design if possible. Wash it on the hottest cycle and dry it in the dryer. 2. Get a mitten pattern at a store or download one. Make the mitten lining out of fleece — any color. Make the outer shell slightly larger and longer. Mittens take very little fabric. 3. Sew the two together. Adjust the design if necessary. Add elastic if you want. Wear and be warm. Enjoy spending time with your child, tween or teen on this project. We have spent more time than money with our kids and have taught them to “do it yourself.” I don’t know if our marriage could have survived the stress of two careers. Someone has to take care of the family and marriage. The myth of superwoman is just that, a myth. Comments: Comments Off on Time or money? And my new mittens. Matt bangs the can again. “You’re on time-out, mister!” Mom drags Matt upstairs to his room, where he uses his “water power” to get even and has an “accident.” Tears are another form of water power. Mom feels hopeless and defeated. The power struggle is defused. Mom and Matt feel better. Matt receives positive attention at a neutral time. They develop a positive relationship and avoid power struggles. Mom can consider a long-term solution and replace the trash can or keep it out of his reach. We dog-proofed our trash can because the dog does not understand words. She has little self-control when something smells really good in the trash. Matt enjoyed the power and attention of banging the trash can and like the dog, had little self-control. “But I feel like moving the can or buying a new trash can is like giving in to Matt,” Mom said. The only winners and losers in power struggles are the participants. What is the cost to their relationship to carry on? To avoid a power struggle, Act, Don’t Yak, coined by Dr. Sam Goldstein. Children under age 5 can be managed by following three guidelines. Take action and use fewer words — before getting angry. Action prevents and eliminates conflict. Be kind and firm when setting limits. Healthy boundaries make children feel safe. Being kind and firm makes everyone feel better. Temper expectations. A young child needs practice to master self-control. They are able to reason at age 7. Follow numbers one and two to help them develop self-control and reasoning. Staying out of power struggles means parents don’t have to bully children into making better behavior choices. Parents feel bad when they resort to bullying behavior — intimidation, and using size and strength. Bully proof your family through positive parenting. The family that shovels snow together is connected — insurance against many youth maladies. My son Ian and I spent a few hours clearing snow from the driveway and moving wood from the woodpile to outside the back door. I multitasked: I got the chores done; got exercise; and connected with my son. * sometimes they have to do something they just don’t feel like. One of the benefits to doing chores is the connection created between kids and adults. This attachment can prevent a child from many dangers, including becoming a bully or from getting bullied according to “Hold onto your Kids: Why parents need to matter more than peers” by Gordon Neufeld, Ph.D. and Dr. Gabor Mate. The book gives examples of how children, tweens and teens who are attached to their parents are better off in myriad ways. They are less likely to become bullies or victims. They are more healthy emotionally. One thing I found most interesting is that when a tween or teens is considered “Cool” they are cut off from their emotions –a precarious way to live. It’s more healthy to admit futility by breaking down into tears. There is much in life that can’t be changed. Crying in futility is healthy and normal. Sometimes I use this therapy myself. Neufeld described a story in which he was interviewed on TV with parents who had lost a child to suicide after being bullied, and with a mother and her daughter who came home from school every day for three months in tears about bullying. Afterward, the host of the show asked Neufeld if the girl was at risk of suicide. Quite the opposite. Her tears over the futility of the situation were healthy. She was alive. The others had perished without a word to their parents, who didn’t know anything was awry. She had an emotional lifeline to her mother. Take the time and effort to use family meals, chores and family meetings to stay connected to your children, tweens and teens. Not only will you have a clean driveway at the end of the day and your kids will know how to cook and clean, you’ll have a resilient skilled young person who is connected to you — insurance against many maladies. Thanks to Amy Chua’s new memoir “Battle Hymn of the Tiger Mother,” we have a new archetype of motherhood — Asian Tiger Parenting. Like the Raising Able approach, Tiger Mothers assume the child is resilient and can handle failure and take responsibility. Tiger mothers’ goal is for their children to compete and win, no matter what the cost. Is that childhood? What Tiger Parents lacks is mutual respect. A Korean friend raised with a Tiger mother was forced to practice piano three hours a day. My friend is an excellent pianist, when she plays. In order to gain her freedom, my friend secretly plotted an elaborate escape when she was 21 years old. Mother and daughter had limited contact for years afterwards. This is not the relationship I want with my children and adult children. It completely lacks in mutual respect for the child’s wishes. Parenting is like a balancing act where power is shared. Parents are the guides, offering boundaries, encouragement and advice. Children are the high wire artists. They practice for hours while parents spot from below, ready to catch them and help them back up. There are advantages and disadvantages to every parenting style. There is no perfect mother or father or perfect childhood. Let the Tiger mothers growl. I hope their children rebel and run away. Sadly, some crack under the pressure to perform, achieve and win. They succumb to depression and suicide. Let the “Battle Hymn of the Tiger Mother” play out her 15 minutes of fame. Lily goes to her crate voluntarily. It's like a playpen for a toddler or a teen's room. It's her space, a place no one can bother her, and she's safe. A crate is a wonderful place for a puppy. I believe in using containment when training dogs and children. When Lily the puppy chews on a plant, I crate her with a chew toy. When a toddler puts a fork in an outlet, he goes into the playpen. 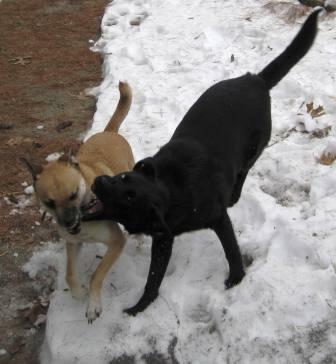 “Act, don’t Yak!” [Dr. Sam Goldstein] Dogs and children of all ages respond to action. They tune out lectures. 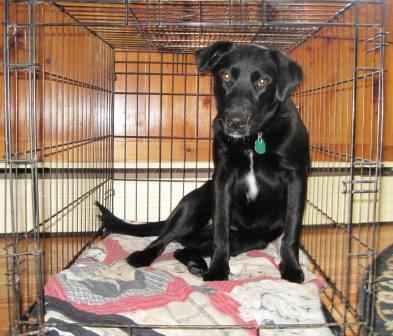 Dogs and tots-to-teens can benefit from containment in a crate, playpen or bedroom. They feel safe in their space. It provides contemplation time for parents and young people. Even though I shepherded four teenagers through adolescence, I never grounded them as punishment. I did shorten their leash when they made poor choices. I didn’t let them use my car except to get to work. I said, “You can have your friends over here while I am home” or “You can stay home with us tonight and watch ‘Lassie’ ” or another G-rated movie. The trouble with grounding and using violent punishment to train a dog or child — like yelling, berating, belittling and hitting — is that it breeds revenge, resentment and rebellion. It shows children and dogs that bullying works to get others to do what you want. I used to think children had to feel pain and be punished to learn. I was wrong. They have to feel consequences to learn, but they don’t have to be violent. Positive discipline always looks for the three Rs — related-respectful-reasonable [Jane Nelsen Ph.D.] — in a natural or logical consequence. It works for dogs and humans. When Lily doesn’t come when she’s called, she gets put on the leash because she has demonstrated she can’t be trusted. When young people show they can’t be trusted, their leash gets shortened. They must stay closer to home, in their room or playpen, where they can re-group and feel contained. Dogs and kids both respond to encouragement, kindness, firmness and consistency. Children and dogs both want to please. When parents bully, children and dogs become bitter and mean. Then they feel hurt and want to hurt back their parents. They can become bullies and/or victims. When Lily makes a good decision, I shower her with “good dog!” and lots of petting. Tots-to-teens respond to encouragement, too. Martin Luther King Jr. Day is a good reminder to work on non-violent parenting skills. Parents, dogs and children can be trained in non-violent discipline. The worst thing about taking care of two extra dogs is the puppy, Lily. When I remember she’s a puppy, I take time for training. It’s the same for children, toddlers, preschoolers, tweens, and teens. Adjust my expectations for their age and take time for training. Lily had the annoying habit of rushing through an open door. 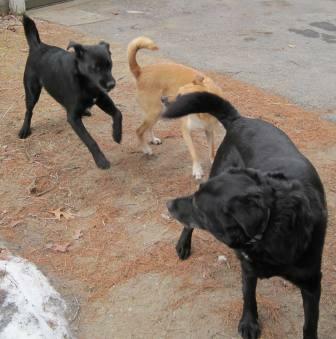 The other two dogs followed her exuberance and created chaos every time the front door opened. UGH! I took the time to train Lily. 2. When she tried to rush out the door, I used a firm voice, said “Hold it!” or “No!” quickly closed the door and brought her back to wait beside the door. This took a few repetitions. I praised her when she did it right. 3. I followed the door routine for several days,. Sometimes she or I forgot and I repeated step two. Lily showed her intelligence by learning quickly. I showed my intelligence by being consistent. As you can see in “after” Lily has gained some self-control and listens to me, which carries over to other areas and establishes me as Alpha. Training also benefits children and teenagers. 1. Anticipate difficult situations and craft a positive parenting plan. For older children, use a family meeting to talk about the problem and solutions. For younger children, act, don’t yak, before getting angry. Following this one step can eliminate about 90 percent of all conflicts with younger children. 2. When the youngster forgets the training, remind him/her and use a related-respectful-reasonable [Source: Dr. Jane Nelsen] consequence in the moment. When the child does it right, use encouragement, not praise. 3. For best results, all adults at home consistently enforce the new training. It’s good to have an adult Alpha at home. This week, pick one behavior issue in your home and take time for training. The younger the child, and the more consistent you are, the sooner they will learn. Be prepared with a plan and Act don’t Yak. You are currently browsing the Raising Able Children: how to nurture capable confident young people weblog archives for January 2011.